Funko have announced that they will release a new line of Mega Man action figures based on the classic series particularly the original Mega Man and Mega Man 2. 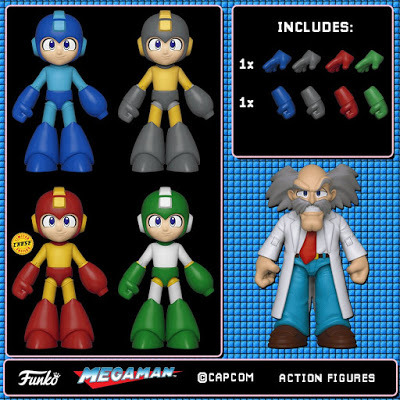 Battle the nefarious Dr. Wily and his Robot Masters with four colorful Mega Man action figures. Choose between Mega Man in his traditional blue armor, Thunder Beam Mega Man, and Leaf Shield Mega Man which boasts an Atomic Fire Chase variant with a 1/6 rarity. You can also pick up Mega Man’s nemesis, Dr. Wily, to reenact their iconic confrontations. Embodying courage, a passion for justice, and restraint when dealing with his enemies, Mega Man is a credit to his creators, Dr. Light and Capcom. The Blue Bomber can serve as a selfless role model to your other figures. Funko have yet to specify the size of the figures and the pricing. However their site does state that they will be hitting store shelves in December.